Life these days has been a little hectic, my writing time has been shrinking to a sad little one day a week affair. But I’m powering through it, I have a new novel in the works, and while it might take me a little longer to write it is coming along nicely. So here’s the opening chapter of my new ghost hunter story. It’s a little longer than my usual posts but if you’re curious about what goes on in my dark little writing hideaway (the outback caravan), have a read through and let me know what you think. Daniel watched the rain weaving patterns on his windscreen. He closed his eyes and inhaled a sharp breath, everything was harder when it rained. This house was out in the middle of nowhere and he was parked on a dirt path for lack of better options. He could only hope the rain was heavy enough to erase the tyre marks when he left. Between the trees he could see the lights flashing as the girl moved from room to room—she had no idea he was outside or of the things he was going to do to her. It was better that way, she would be easier to sneak up on and her spectres would be unprepared for his attack. He unzipped his jacket and checked the tools were secure; the lock-pick, torch, mirror and a flick knife for back up. He pulled the black leather gloves over his slim fingers and unbuttoned the sheathed knife in his boot. There was no point waiting any longer, it wouldn’t get any easier. Daniel released the door, the hinge locking halfway before he shoved it open and stepped into the winter wind. The mud squelched beneath his boots—he would need to check for those tracks on his way out too. He slipped quietly between the trees, ignoring the rain seeping into the neck of his jacket. It was dark outside, she probably wouldn’t see him sidling up to the windows but he paused anyway. She stood in the kitchen, her eyes cast on the pot as she stirred the contents and put it back in the oven. She appeared to be a few years younger than him—in her early twenties at most—her light hair tied back in a loose ponytail. It was the most relaxed he’d seen her. For a second it made him wonder if now was really the time, if it wasn’t exactly the right moment he had no way of knowing if he was doing the right thing. And he didn’t want to kill anyone who didn’t have to be killed, especially someone so young. She started to head back to the lounge room, absentmindedly scratching her arm as she walked past the window. Suddenly her eyes widened and panic filled her expression. Daniel found he’d been holding his own breath until that moment, silently hoping he’d been wrong and he could turn back and leave her for another night. But this was it, she’d seen them: the ghosts in the reflection. A glass had slipped from her hand and shattered on the tiles beneath her. She stood frozen for a moment before the spectres stepped back into the veil. Now she was probably trying to convince herself what she’d seen wasn’t real. She moved closer to the window and wiped her hand over the glass. Daniel retreated into the shadows but he guessed she was too scared to consider looking outside anyway. Deep down she would know the reflection she’d seen only moments ago wasn’t human. He watched as she tried to find it again, her eyes blinking rapidly in an effort to recreate the image. But that wasn’t the way it worked. The spectres couldn’t be called upon by the damned, they came to them when they were least expecting it. Usually lurking in the mirrors until the victim was at their weakest. Their dark, twisted faces seeking them in windows and pools of water, building on their fear until they thought they were losing their mind. It was Daniel’s job to stop the spectres gaining control, but there was no way to save the host, their life was already considered lost. This girl standing on the other side of the glass, her innocent features so tortured by fear—she was as good as dead—the best he could do was end her suffering. The girl was busy trying to collect herself, Daniel moved round to the other side of the house where the lights were off. He walked until he found a room with hard flooring instead of carpet, the last thing he wanted was to leave muddy footprints for the police to find. The girl would still be in the kitchen, the spectres would leave her alone just long enough for her to think she’d imagined them. He took the time to scrape the mud from his boots before he unzipped his jacket for the lock-pick. He worked quickly and silently, feeling the latch drop to the side before he slid the door open. A rush of central heating blew into his face but nothing could ease the chill from his bones before he made a kill. The only way he knew to do it was as fast as possible so his conscience didn’t have time to catch up with him. The sound of the TV streaming from the lounge room helped to mask the sound of his footsteps. He paused before he turned each corner, within minutes they would be face to face but he couldn’t afford to be surprised by her. Once she saw him her spectres would appear at the surface of the veil and that was his moment. The ghosts could only be viewed indirectly until he was willing to move into the veil himself. Eventually he would have to but even a few seconds of studying them would give him an advantage once he slipped into their dark world. He pulled the mirror from his pocket and used it to scan the kitchen, the girl was gone and she’d taken her ghosts with her. She was most likely watching TV, trying to ignore that creeping feeling she wasn’t alone. Daniel switched the oven off as he passed it and reached the doorway of the lounge room. There she was, straight backed on the couch, arms tight around her chest, her back to him as he used the mirror to watch her spectres. They moved faster now he had joined them, their ghostly arms trying to punch through the veil and enclose him. He could almost feel them gripping his throat as though they knew what he was here for. They would be screaming too even though he couldn’t hear them, he wasn’t the one who was damned, but the girl before him turned her head to the side as she listened. Just as the spectres couldn’t be seen directly they couldn’t be heard that way either. It was in echoes she would hear their ghostly taunts, they would be getting louder as Daniel’s presence angered them. Her shoulder’s tensed before she grabbed the remote for the TV and switched it off, in the darkness of the screen she saw another reflection, this time not just the spectres, but herself, and Daniel hovering just behind her. She screamed and jumped from her seat, cheeks already pink with stress as she turned to face the man in black standing in her home. He held his hand out to make her pause, if she became too irate her spectres would be harder to fight. It was always a difficult choice to make—the more effort he put into calming her, the harder the kill would be. Her deep blue eyes filled with tears and what he saw in them weakened him. This was the first time he’d seen her up close, he hadn’t expected to be moved the way he was. “It’s okay,” he whispered on impulse. For a moment she looked as though she wanted to jump into his arms and beg for comfort. It just proved how much the spectres were already influencing her thoughts. His expression must have held her back. “Are you here to hurt me?” her jaw was trembling so hard it looked like it might lock. Daniel’s heart beat harder, he couldn’t afford to talk to her anymore. He lifted the mirror and held it to the side of her face, the spectres’ angry eyes flashed in the reflection so suddenly he couldn’t help reacting. The girl turned to the mirror and she caught sight of her own ghosts once again. They were furious, their faces morphing together to form a grotesque image, a sight so frightening her knees weakened and dropped her to the ground. Daniel pulled the bowie knife from his boot and the moment her spectres saw the weapon they found the strength to reach beyond the veil. That was the thing about ghosts of the living, they weren’t powerless like the ghosts of the dead. They slipped inside her one by one; her once innocent eyes immediately turning to fury. That image was just what he needed to finish the job. Her hands stretched out like claws as she launched at him, her strength multiplied by the spectres inside her. She went straight for the knife, her delicate hand locking around the blade as her eyes seemed to draw him in. Daniel yanked the knife away, waiting for her blood to spill on the mahogany flooring, but her skin was left untouched. He paused a moment to make sense of it and that was exactly what they were expecting. The girl jumped and hooked her arm around his neck, she was small but the force of it knocked his balance, he stumbled and bumped into a table, knocking the lamp to the floor. Her hand gripped the side of his face, her fingers digging so hard he was sure he must be bleeding. The spectres were stronger than he thought. He threw his knife on the floor before she could take it from him, grabbing her arm and tipping her over his shoulder. She hit the ground with a thud but still it didn’t stop her. Her eyes were no longer a deep blue, they were a black abyss, the spectres using her life force to gain more power. There was only one way to destroy them. He held the mirror at arm’s length, using the reflection to watch the spectres moving inside her. There were more than usual, at least five, all working together to manipulate her body. They were fast but once he moved into the veil everything would slow down. She snatched the mirror and smashed it against the floor boards, lifting a jagged piece to use as a weapon. Daniel took a step back, knowing it had to be now. If he didn’t go to the other side she would kill him. He took a deep breath because once he crossed to the other side he wouldn’t be able to take another. His eyes shuddered closed as he concentrated on slowing his heart rate—within seconds the ghosts started to weave into his consciousness. Usually he spent all his time trying to block them but once he allowed the channel to open they would do the rest. Their hands reached out, their cries growing louder in his ears as they locked their icy cold fingers around his chest and pulled him through the veil. His body felt numb, the atmosphere inside the veil was different, like it was just a dream. It was as though he was dead, his heart and lungs slowing to a dangerous pace as every shred of hope and happiness he once felt was stripped away from him. It was difficult for the body to adjust, his muscles contracted as the panic tried to take control of him. The ghosts surrounded him, all their faces reflecting the girl he’d come to kill. They were her ghosts after all, created and sustained by her. They were attached to her life and that meant they were capable of influencing the world in dark and violent ways. But everything had a weakness and he knew theirs. His presence inside the veil distracted them, their voices grew louder as they lashed at him, their ghostly tendrils wrapping around his body, making movement more difficult. Straining to escape them would do no good, what he wanted was to focus their attention so he could slip back to the other side before they had chance to realise his intentions. He turned his head, the other side still visible through the veil. The girl was on the floor, her hair now messy and hanging in her eyes but he could tell by her posture the ghosts had left her. Instead they were feeding on him, using their translucent hands to reach inside his body and take the energy they desired. It didn’t take long for his body to droop, he was growing tired and the longer he spent here the harder it would be to get back. If he focused his attention on the physical needs of his body he could shake the veil, but he had to act quickly before the ghosts moved back to their host. His lungs were starting to burn, in this world they didn’t need air but his mind still craved it. The more he thought about oxygen the more he wanted it, there was a stagnant feeling in his chest, a feeling he couldn’t bear any longer. The cold grip of the ghosts started to fade as he focused his mind. Daniel’s lungs fought back, heaving as though the sheer force of it would create the air he needed. The haze over his eyes cleared, his body warming and stomach lurching as though he’d been dropped to his feet from a sickening height. The girl lifted her head the moment he returned to his body, her eyes glistened as she stared up at him for mercy but it was too late for that. Daniel pulled the flick knife from his pocket and used his boot to pin her shoulder to the floor. She didn’t make a sound as he pressed the blade against her skin and drew it across her throat. Blood seeped from the wound but he didn’t allow himself to take in the sight. Usually he reached only for his mirror to check the spectres had been destroyed—that’s how he knew his job was complete. But the mirror was broken into small pieces, the only one big enough to use was already covered in the girl’s blood and he knew better than to pick up soiled items. Her eyes were open and staring, the lifeless pupils surrounded once again by pure blue. Suddenly the house seemed too silent. He collected the bowie knife from the floor and secured it back in his boot. There was a mirror on the wall, he stood in front of it and checked his face for scratches—there were red marks where she’d pressed against his cheek but the skin wasn’t broken. He used the reflection to check the body behind him. There were no auras moving around it, no spectres floating nearby, everything was still and there was nothing left to do but cover his tracks. The first couple of hours after a kill always passed in a haze. He’d learnt to switch off the emotional thought process and focus on the job. For it was in the hurry to leave a site of murder that mistakes would be made. Instead he breathed deeply and calmly, spending time scouring the rooms for evidence and carefully removing anything that could place him at the crime scene. The rain outside had grown heavier, the mud thicker when he finally stepped out and relocked the door he’d entered. The footprints from earlier had already been washed away and after checking the sky he felt confident the weather would destroy all signs of his presence within minutes of leaving. Rain gathered in the neck of his jacket, a steady stream flowing down his back as he turned his head to check amongst the trees. Goosebumps formed on his torso, the wind following the water and turning his skin to ice. But he was alone, he felt sure of it. The house was so remote there was little chance of anyone seeing him. Still he sat in his car for a long time, quietly observing his surroundings before he prepared to leave. His hands were sweaty, he pulled his fingers free and slipped the gloves inside a paper bag. The adrenaline was wearing off and his hands were shaking. It wouldn’t be long before the flashbacks started. Daniel drove a long way and as the distance grew his mental state started to change. He’d completed his job—the kill and the clean up—as a professional he’d succeeded. There was nothing left to focus on, no evidence to hide, no body to dispose of. Now he was just a man—a man who had committed murder. Just over a month ago I released the four books in my series, a lot of people asked me what was next and my answer was always, “I’ll just keep writing.” People wanted to know if I would take a holiday, after years of writing and editing didn’t I want some time to relax? The truth is I don’t feel relaxed unless I’m writing, in fact I’m lost without it. For the first three weeks after the book release much of my time went into promotional work and record keeping but as I got the hang of it all I found myself with spare time again. Part of me struggled with the idea of letting go of The Shadow Series, the thought of working with new characters did freak me out a bit, I felt like I was abandoning relationships with my friends—even if they were imaginary. I realised it might take me longer to adjust than I initially anticipated. And it scared me to think how long it could be before I was ready to work on something new. I tried not to focus on it too much, but there was this underlying fear; what if the Shadow Series was all I had in me? What if I couldn’t move on? I’d also sent out a lot of review requests to book bloggers and I felt like I needed to be working on something new before the reviews came back. I opened my mind to new ideas, I started recording dreams and taking notes every time a potential plots came to me. I had plenty of inspirations and a few really cool pieces to fit into a book but individually they weren’t strong enough to work on their own. It didn’t take long for my spare time to turn into immense boredom, there is a quote about writing which explains this perfectly, “Writers don’t take vacations, they are either writing or thinking about writing.” And that is exactly the reason I felt so bored without a project to work on. 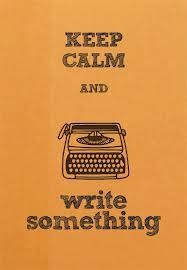 I can handle not writing if I can at least think about writing. I need those characters alive in my head all the time. I have a pretty active social life, with great friends and family there’s plenty of things I can do to fill my time but it’s the hours in between that kill me. What do people think about when they’re waiting at the traffic lights, exercising, waiting for a friend or trying to fall asleep? My life feels aimless without a story to focus on so after a few weeks this boredom started to get to me. I decided the time was right. I didn’t have a fully formed plot but I had some cool ideas, I decided I would find a way to fit them all together. I’ve been reading a lot of ghost stories lately, I loved being scared and feeling as though the story really got under my skin. I wanted to spend more time in that dark world and thought the only way to become more involved is to write it instead of just reading it. I decided that would be the premise for my new story. The Shadow Series is written in first person from the point of view of a female, I wanted to do the complete opposite in my new book, so the main character is male and it’s written in third person. The other elements are a combination of dreams, documentaries and nonfiction books I’ve read. 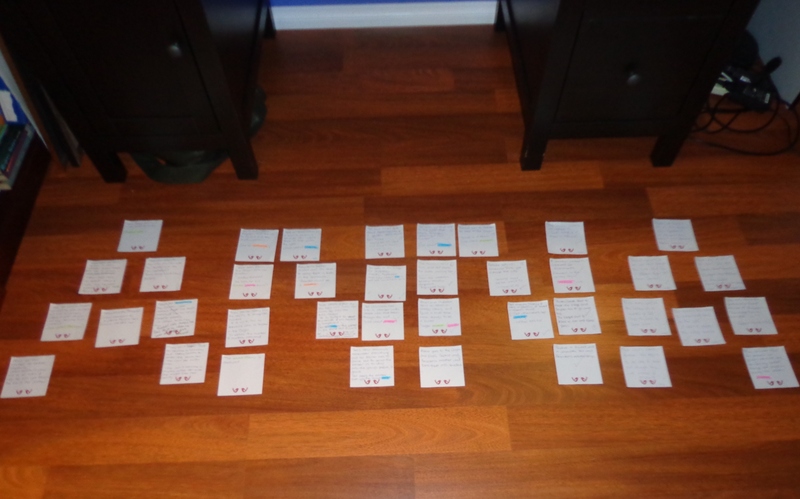 I started writing it on the 6th of June, but progress was slow. It took me a full week to finish the first chapter. It was just so strange working with a new character, after knowing my old characters so well this one felt too superficial. I pushed on but I was distracted. Partly because I was going to be submitting this chapter to my new writing group for critiquing and I was nervous about it. It was a work in progress but the quality of writing from the other members was so high I felt intimidated, I kept thinking, although it was a draft it had to be a damn good draft! I went to the writer’s group and received my critique. All the anticipation was completely unwarranted. Everyone in the group is really supportive of each other, they gave amazing advice and after spending 3 hours in their company I felt my passion coming to life again. It wasn’t just receiving comments on my own work that inspired me but being involved in their stories as well. Seeing how some scenes affected all of us in the same way and realising the power in those words. I’ve received a lot of feedback on my writing from beta readers but the advice from writer to writer is quite different. It opened my eyes to new concepts and gave me more faith in letting the reader create the scene themselves. I can’t wait to see where it takes me! So I went home and continued working on my ghost story, it took a little while to find my rhythm but by the end of the week I started to feel really excited about writing again. The character has more depth in my mind, the plot is almost completely mapped out and I have something to think about when I’m waiting at the traffic lights and trying to fall asleep. Everything is as it should be—life after The Shadow Series does go on! Creating The Shadow Series took four years of my life, close to 18 months of that was spent just on editing. A lot of people underestimate exactly how much editing goes into a book, the truth is it’s more important than the writing. When you’re in the process of penning your story it’s surprising how many stupid mistakes come out, it doesn’t mean you’re a stupid person it’s just that you use different sides of your brain to think logically and creatively. When you’re concentrating on plot there is no way to make sure you’re adding all the necessary commas and apostrophes. The best way is to make as many mistakes as it takes to get that story out and deal with the cleanup after. Which means you can’t neglect the editing process, it should take the same length of time it took to write the book, if not longer. When I’m working on a new novel I usually spend about six hours writing, stop for a break then spend about two hours going over what I’ve written and making sure the dialogue and characters are coming across the way I intended. During this check I correct obvious mistakes but I focus more on plot than spelling and grammar. Aside from this nightly check I don’t go back to the beginning of the book until I’ve finished the first draft. It’s too easy to get caught up in the first 30 pages, if you start trying to correct it you lose the rhythm and end up trapped in a never ending cycle. Once the draft is finished I get out a fresh notepad and start at the very beginning. This first pass isn’t to make corrections either, it’s simply to read and take notes. I try to read the story as though I didn’t write it, focusing on how a reader might interpret the plot. My notes usually end up sounding like a bit of a joke, things like; pg 2 – cheesy paragraph, chapter 6 – needs restructure, page 57 characters sound whiny and annoying etc. It doesn’t matter exactly what the notes say, as long as I know there’s something wrong with it and I need to rewrite that section. The faster I complete this first read the easier it is to notice mistakes in consistency, sometimes you will say it’s winter in chapter 2 and a couple of pages later it has changed to summer. You’d be amazed to know how many times simple mistakes like that slip in. The good news is you get better at picking up on these mistakes and countering them. I learnt a little tip from another author along the way and it has been an incredibly useful tool. When I write a new character or location into my books I create a profile card for that person or place. Profile cards and my mini filing system. It contains just simple notes like appearance, eye/hair colour, name, age, personality traits. The card is then filed away in my profiling folder and each time I refer to them I have a reference. Before I discovered this handy strategy I was shocked how many times a person’s eye colour changed without me realising I was doing it! Tricks like this make you more efficient but they are things you can only learn with experience, it’s all about trial and error, learning what works for you. Once the first read is finished, I have a notepad filled with suggested changes, I then start at the beginning and rewrite all the sections that have problems. Here’s where it gets tricky, the more you rewrite the more inconsistencies that pop up, so when you’ve finished the entire draft you have to go back to step one—read the manuscript from start to finish, take notes and rewrite until everything is flowing smoothly. I find this usually takes three passes, but that’s not the end of it. There will always be problems, things you don’t notice no matter how many times you read it. The best thing is to get a fresh pair of eyes on it. For me this person is my sister. 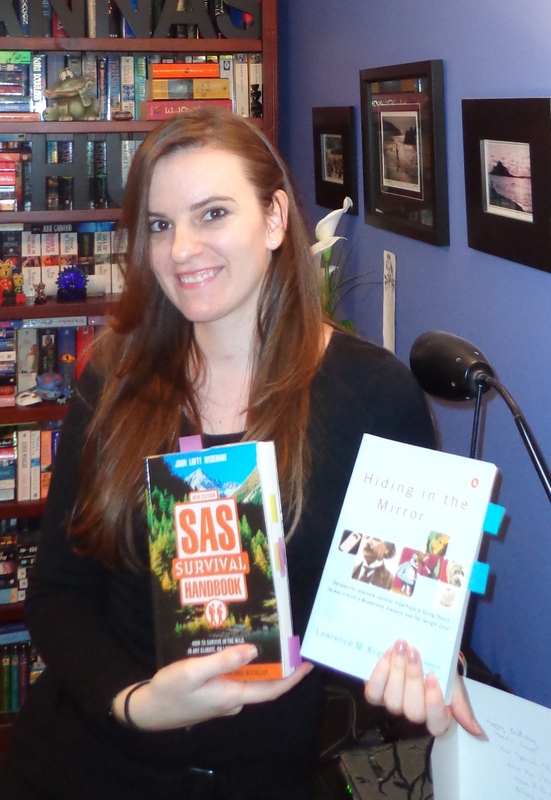 Sarah has been mentioned in various blogs now and the reason is that these books would be very different without her input, she deserves credit for that! Sarah reads faster than anyone I’ve ever known, she can get through a manuscript within 24 hours and her speed actually makes her better at picking up flaws. Most people would read a few chapters and take a break which means they might not notice an incorrect weather change or a misplaced event. Sarah picks up tiny details I hadn’t even considered looking at, she gives me an overall opinion of the storyline, she notes chapters where the wording seems off and she tells me when a character is behaving in a way that doesn’t suit their profile. Her input is invaluable so I can’t thank her enough for that. After Sarah’s feedback I make the suggested corrections, depending on the amount of work required this is usually done in two passes. Once that’s complete I send it out to close friends and wait for their feedback. It’s also really interesting how people interpret things, everyone reacts in different ways and hearing various angles helps me gain perspective. It sounds ridiculous but one of the most useful feedback points is when a person tells me a character annoyed them, it makes me realise I’ve overdone something, I can then go back and take out repetitive thought cycles that makes characters seem like they’re over thinking things. For The Shadow Series I received a lot of feedback via email, I printed them all off and kept them in a folder to revisit when I’d finished the entire series. 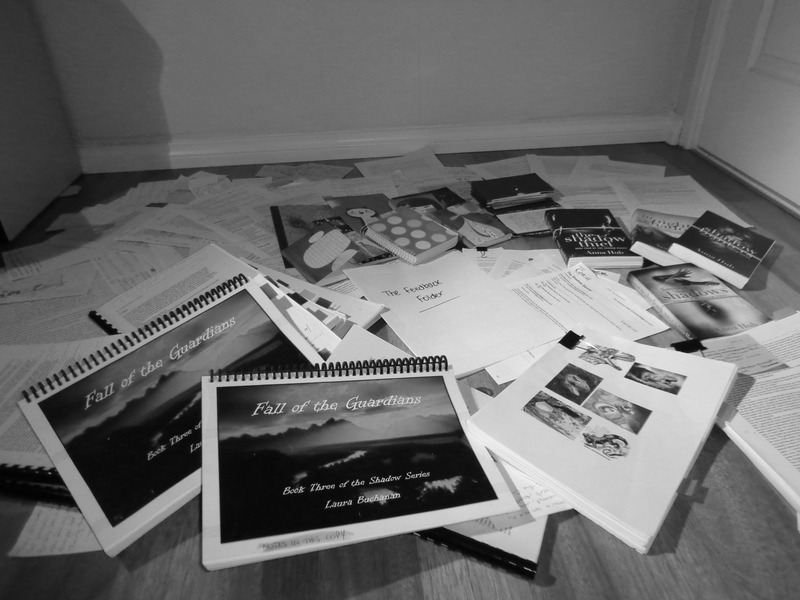 All the notebooks and drafts used in the editing process. Completing the final book was an amazing feeling but I knew there was still a lot of work to be done. They often compare a person’s first book to having a child, you love it so much that you can’t see if it’s imperfections, many authors advise that you should cradle your first book until that first love fades away and then if you still think it’s good enough—try to publish it. By the time I reached book four I could see that book one was pretty ugly. I felt the series had the potential to be published but it had been so long since I wrote the beginning, it was no longer an accurate representation of my writing skills and I knew I could do better. I rewrote book one, essentially the storyline remained the same but I changed sentence structure and took out unnecessary pieces of information. 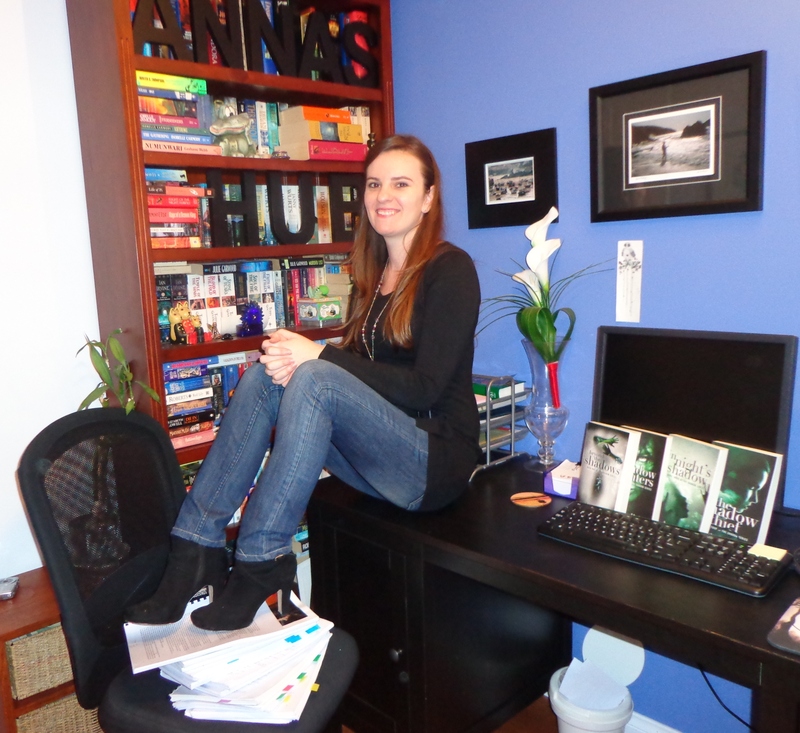 Most authors publish books as they write them, I was lucky enough to be able to go back to the beginning and take out plotlines that were started and then abandoned. I added emphasis to the things that were relevant to the future of the characters and changed all the little details according to the feedback I’d received. I knew the editing process was going to take a long time, I allowed myself a year but it took an extra 6 months. The first edition of Beyond the Shadows. Before releasing it to the public there was still one final process to get through, so much had changed in the series from when I first wrote it, I needed a final interpretation. I asked my mum to be responsible for the last language edit, the spelling and grammar check. I’d read the books so many times I found it near impossible to see it objectively. Thanks so much to Mum for working through them! I also wanted one last lot of feedback from Sarah. I did cut the timing pretty fine, she was due to have a baby in March 2013 and I sent her the four books a few weeks before. She can read fast but there were a lot of distractions as she prepared for her first child. The week she was due I resigned myself to the fact that she wasn’t going to get time, words can’t describe my delight when she told me she’d read them during the week that was overdue. She lives on the other side of the world so we spent hours on the phone conducting a full run through. 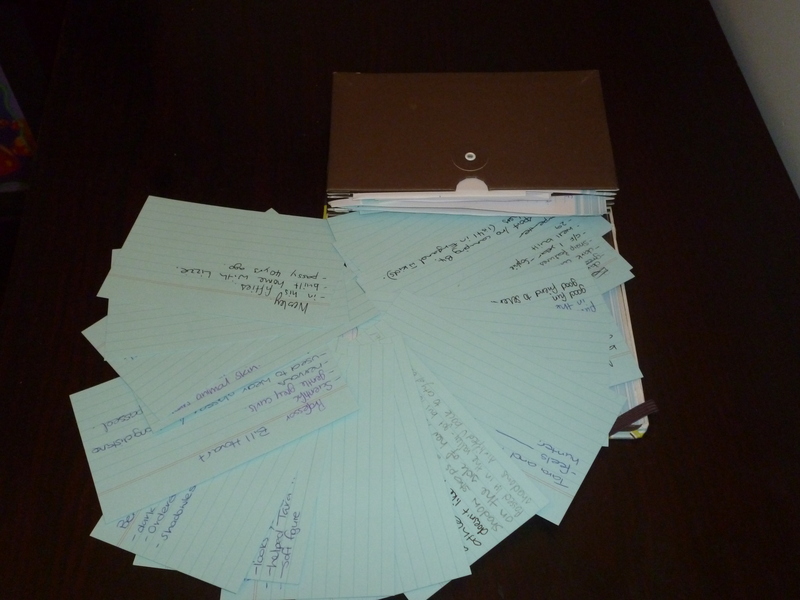 It was the most thorough feedback I’ve ever had, literally down to individual sentences. She went into labour 48 hours later. That woman is amazing, and thanks to her beautiful daughter for hanging in those extra few days! 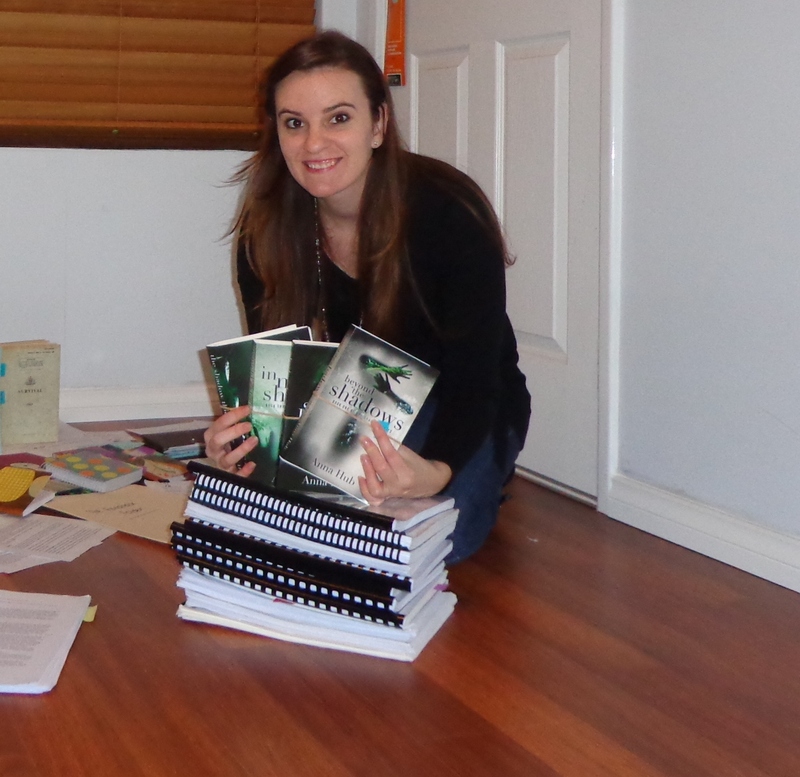 Editing four books back to back has been a great challenge to my stamina and motivation. It’s certainly been difficult to maintain concentration, there were days when I truly felt like I had nothing left to give to this series but I pushed through it knowing I would never forgive myself if I didn’t give it everything I had. The sense of achievement is pretty amazing, I feel this quote from Claire Corbett sums it up perfectly. 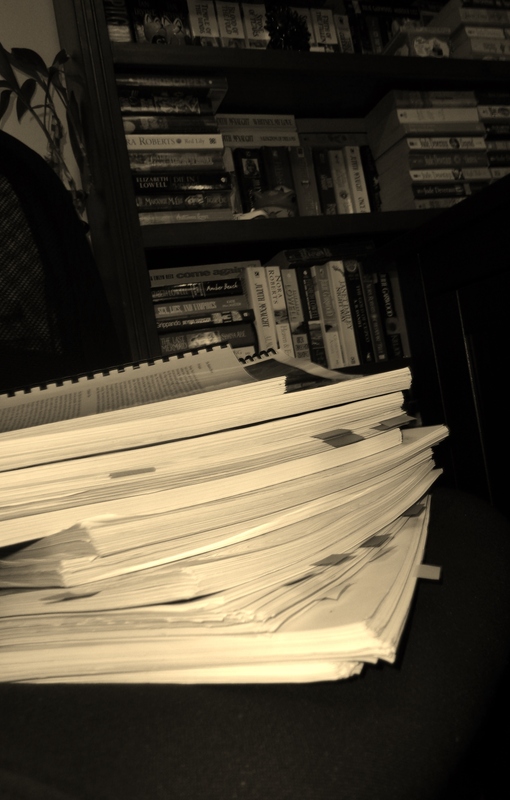 If you think all that sounds like a lot of effort there was one final hurdle—publishing. Part III Publishing The Shadow Series will be published Sunday 12th May.